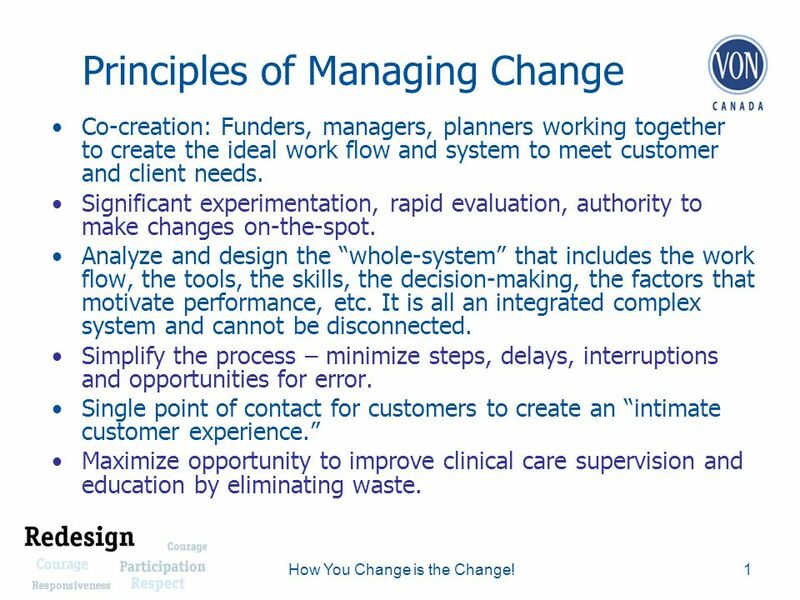 Principles of Managing Change Co-creation: Funders, managers, planners working together to create the ideal work flow and system to meet customer and client. 1 Principles of Managing Change Co-creation: Funders, managers, planners working together to create the ideal work flow and system to meet customer and client needs. Significant experimentation, rapid evaluation, authority to make changes on-the-spot. 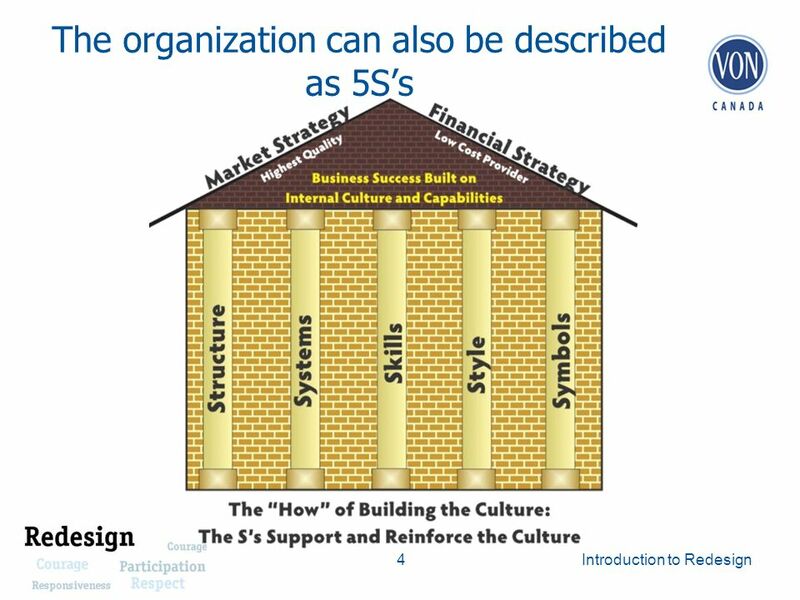 Analyze and design the whole-system that includes the work flow, the tools, the skills, the decision-making, the factors that motivate performance, etc. 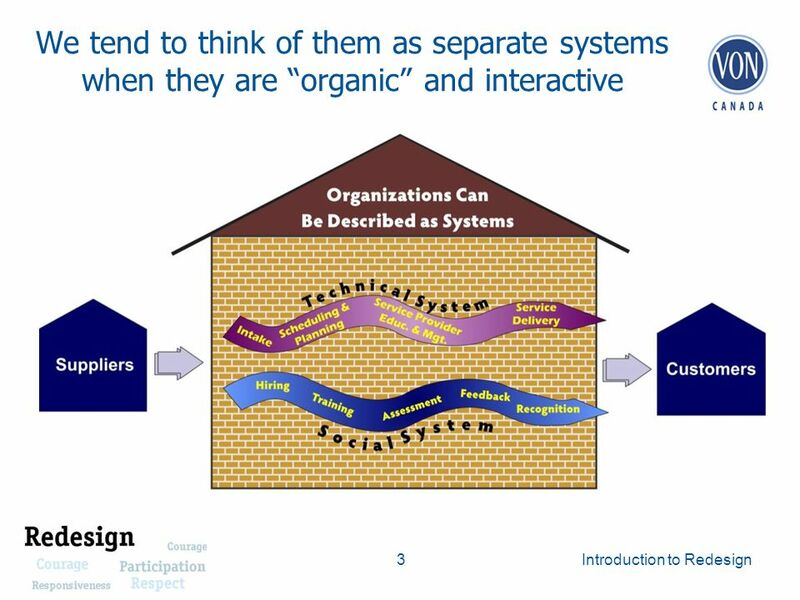 It is all an integrated complex system and cannot be disconnected. Simplify the process – minimize steps, delays, interruptions and opportunities for error. 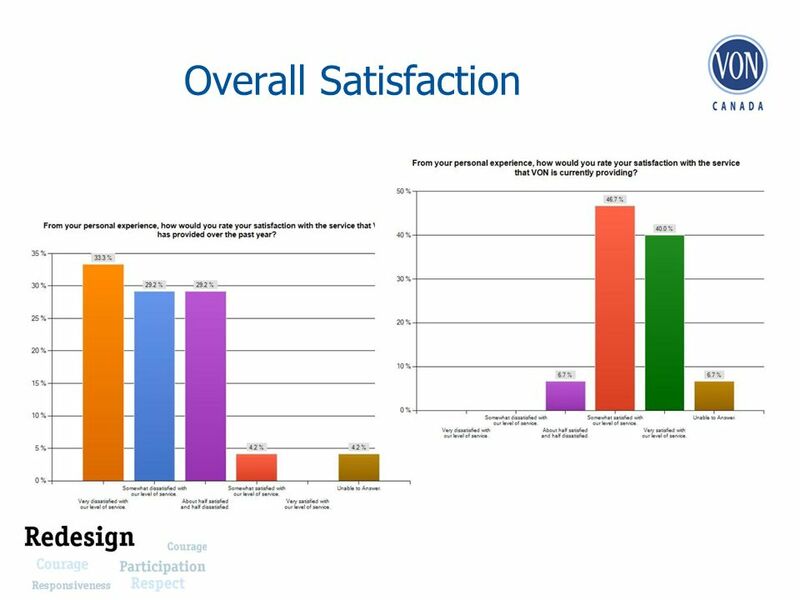 Single point of contact for customers to create an intimate customer experience. Maximize opportunity to improve clinical care supervision and education by eliminating waste. 1How You Change is the Change! 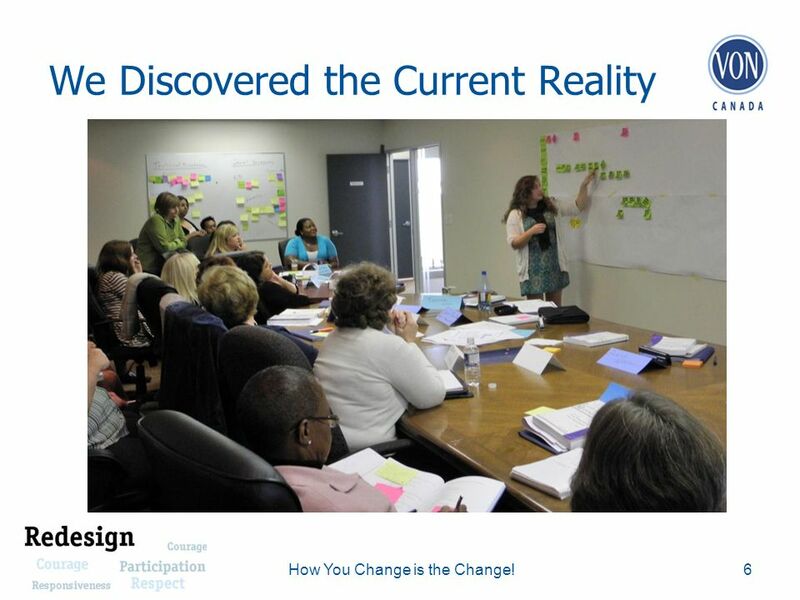 6 We Discovered the Current Reality 6How You Change is the Change! 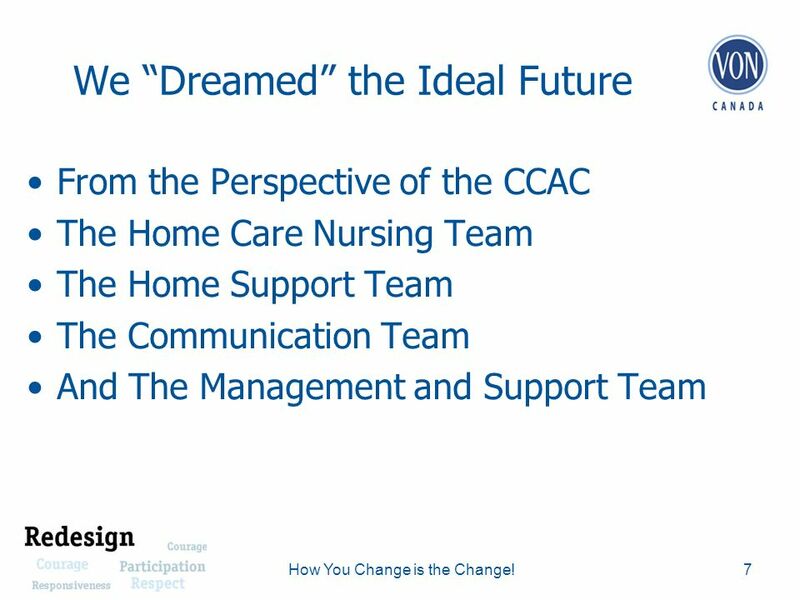 7 We Dreamed the Ideal Future From the Perspective of the CCAC The Home Care Nursing Team The Home Support Team The Communication Team And The Management and Support Team 7How You Change is the Change! 8 We Designed 8How You Change is the Change! 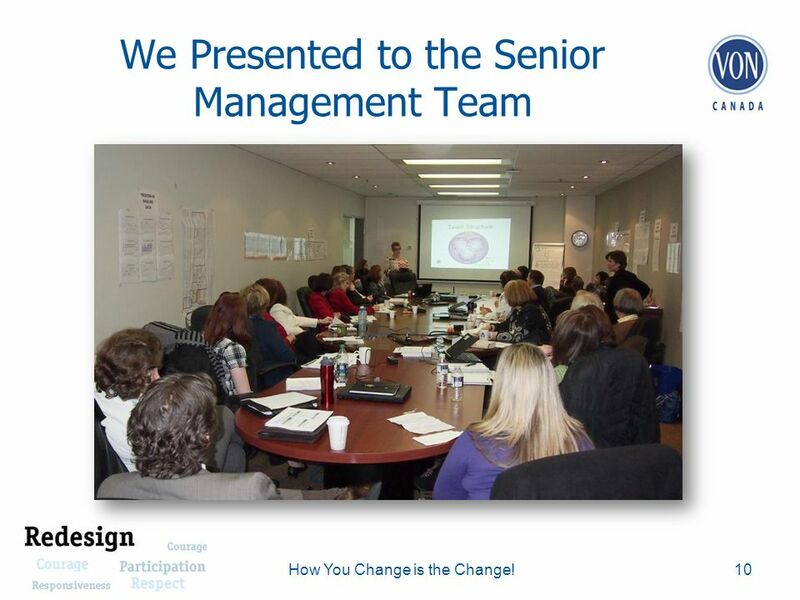 10 We Presented to the Senior Management Team 10How You Change is the Change! 11 We are building toward a process and organization that will meet future customer and client needs. 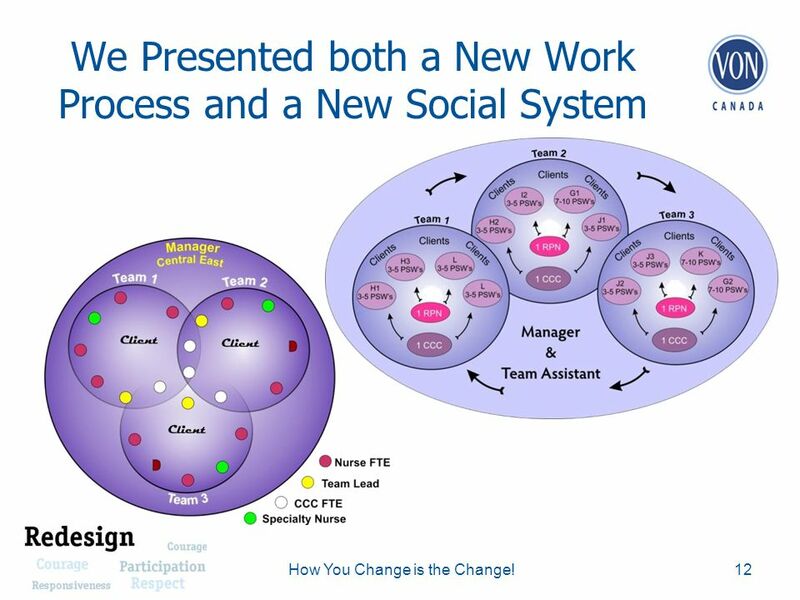 12 We Presented both a New Work Process and a New Social System 12How You Change is the Change! 13 What Happened? 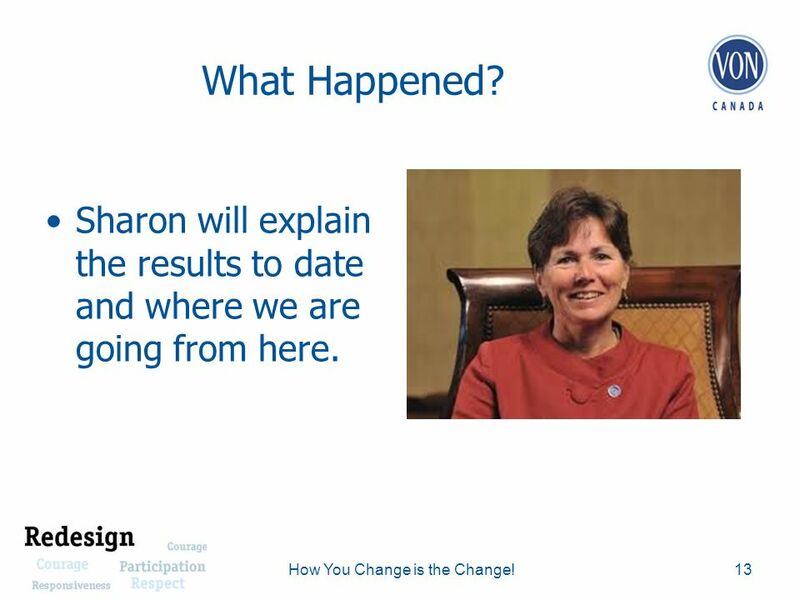 Sharon will explain the results to date and where we are going from here. 13How You Change is the Change! 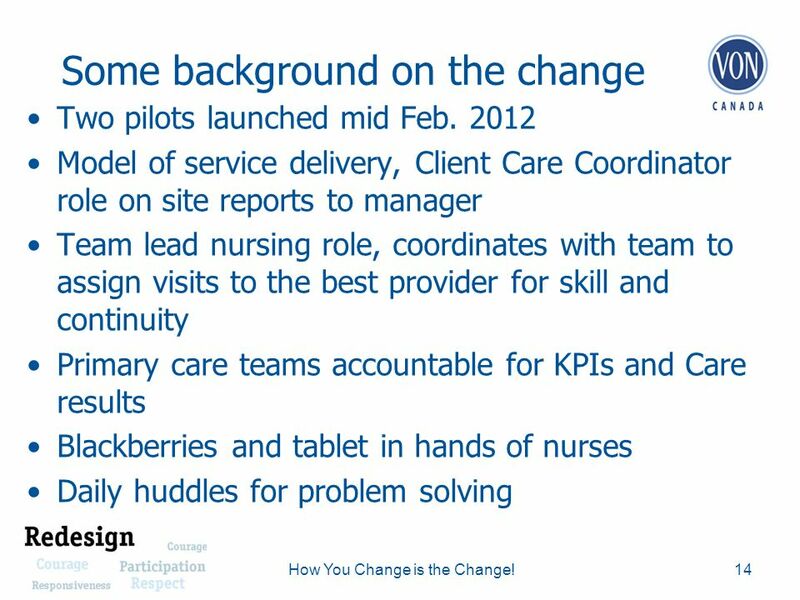 14 Some background on the change Two pilots launched mid Feb. 2012 Model of service delivery, Client Care Coordinator role on site reports to manager Team lead nursing role, coordinates with team to assign visits to the best provider for skill and continuity Primary care teams accountable for KPIs and Care results Blackberries and tablet in hands of nurses Daily huddles for problem solving 14How You Change is the Change! 17 So, after a few months, what happened? The time required to schedule a care provider went from an average of five hours to approximately five minutes. The steps in the process were cut in half. Managers now are freed to provide better supervision and training. 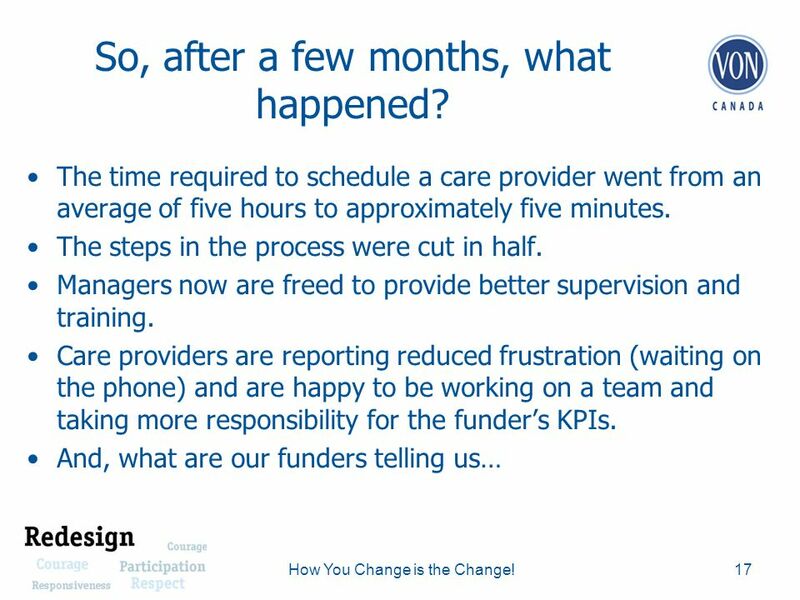 Care providers are reporting reduced frustration (waiting on the phone) and are happy to be working on a team and taking more responsibility for the funders KPIs. 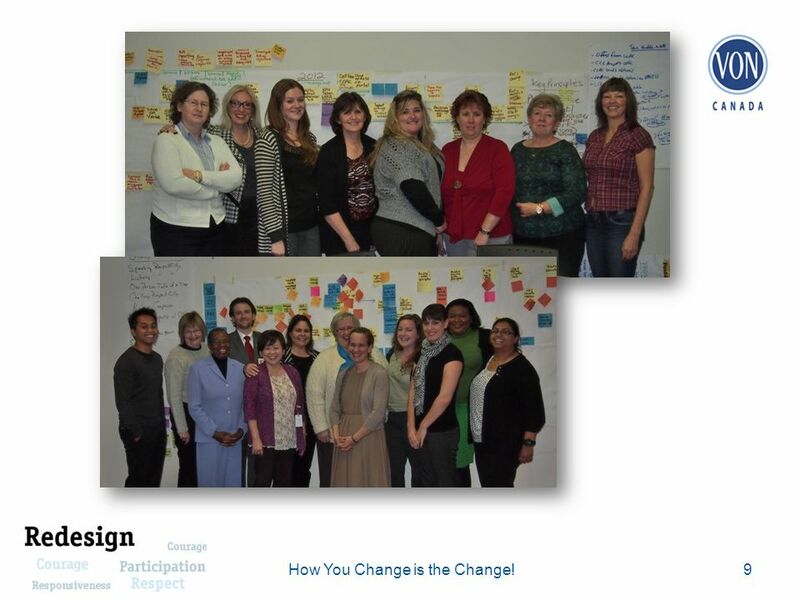 And, what are our funders telling us… 17How You Change is the Change! 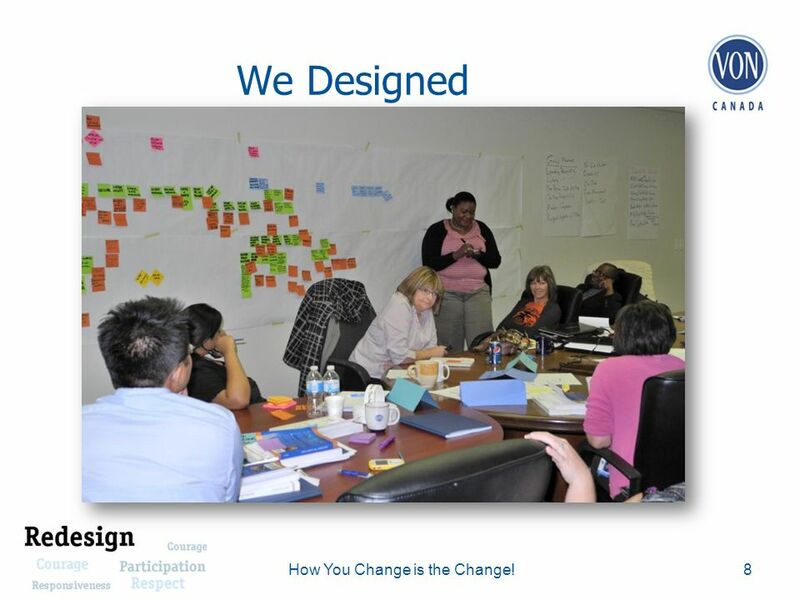 18 Next steps The redesign was piloted in Trenton (SECCAC) and in Scarborough (CECCAC) VON is now in the planning phases for all CCAC contracts in Toronto, Peterborough and Thunder Bay Immediately following is London, ESC, Perth Huron, Grey Bruce Next we will work with Hamilton and North Bay 18How You Change is the Change! 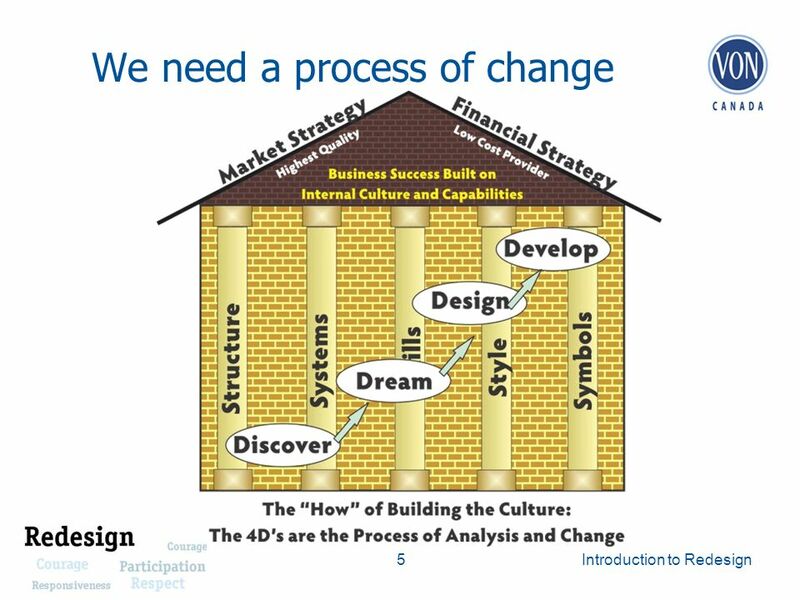 19 Now that we have done Whole-System Design we begin Continuous Improvement 19How You Change is the Change! 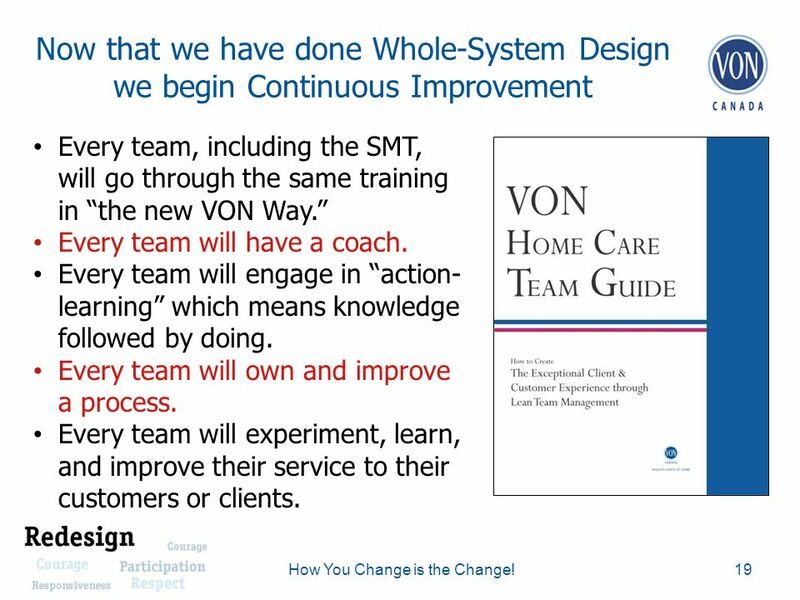 Every team, including the SMT, will go through the same training in the new VON Way. Every team will have a coach. Every team will engage in action- learning which means knowledge followed by doing. Every team will own and improve a process. Every team will experiment, learn, and improve their service to their customers or clients. 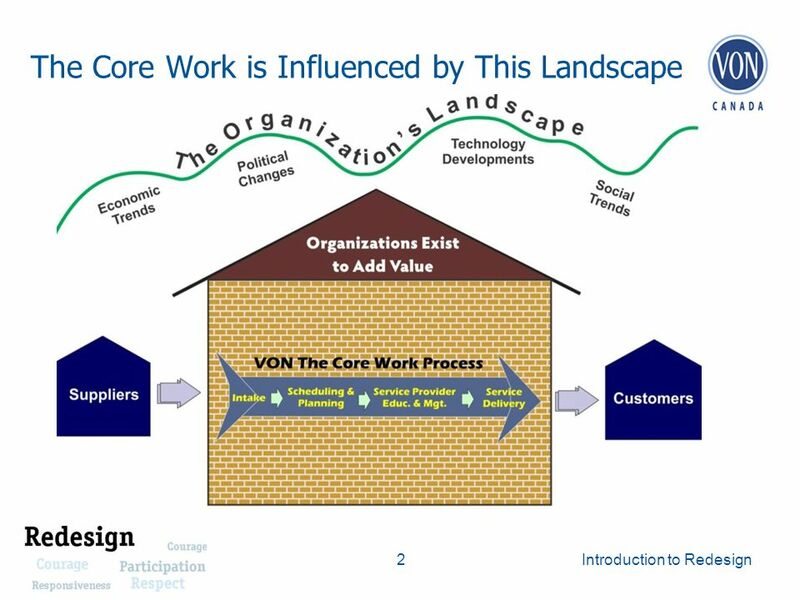 Download ppt "Principles of Managing Change Co-creation: Funders, managers, planners working together to create the ideal work flow and system to meet customer and client." 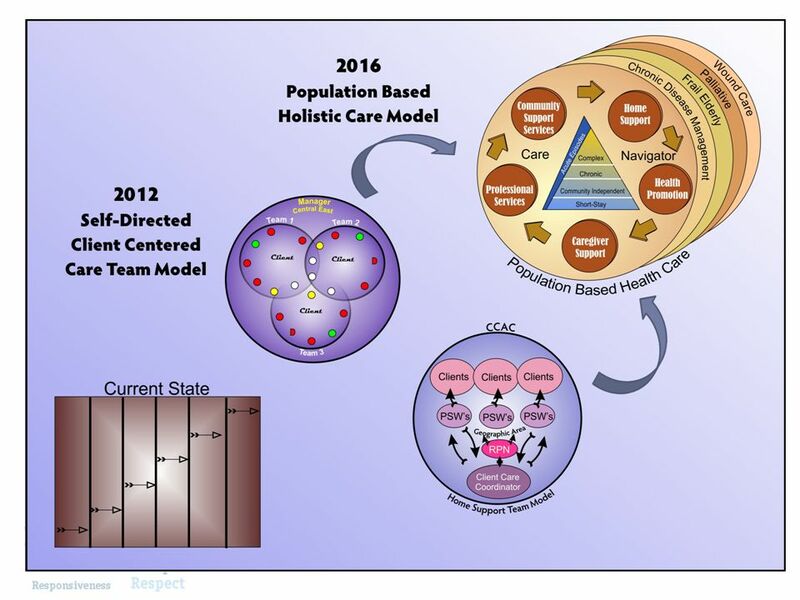 The Phoenix Project Integrating Effective Disease Management Into Primary Care Using Lean Six-Sigma Tools John Oujiri, MD Cynthia Ferrara, MS St. Mary’s/Duluth. Partnership for Quality Education (PQE) Partnership for Quality Education (PQE) Collaborative Interprofessional Team Education Initiative (CITE) Carol. Welcome School Improvement Advisory Committee Members We are happy youre here! VIG Project Dissemination Event July 26 th, 2012 Robin Sen (University of Sheffield) 1. 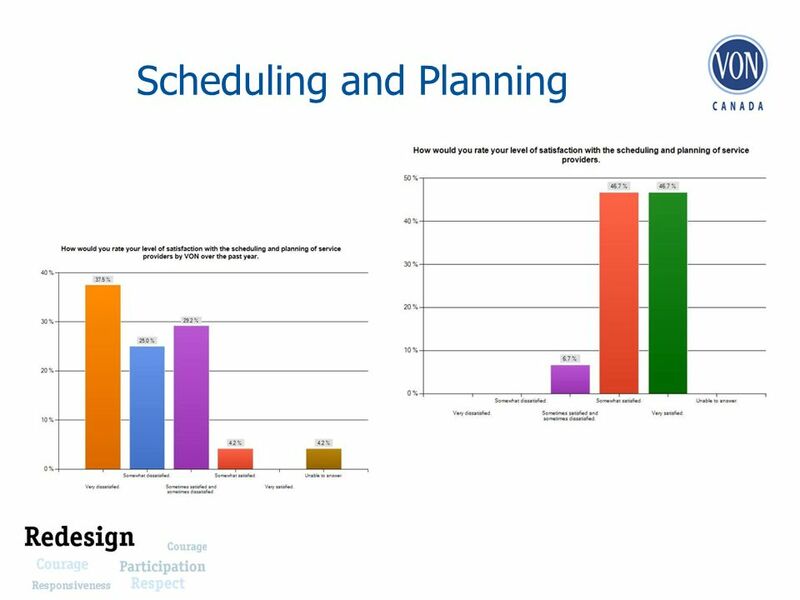 A Scheduling Development Shared by: Community Living Toronto [CLT] and DYAD Infosys Ltd June 8 th, 2012. 1 Daniel Avrahami – Doctoral Symposium – UIST06 Who, What, and When: Supporting Interpersonal Communication over Instant Messaging Daniel Avrahami Carnegie. When I’m at work: Solving problems. Premier-ESA Enabled by EXCEED. Empowered by Microsoft. One of a kind service agreement that brings you a perfect balance of services and support. Premier-ESA. Lasting Behavior Change Achieve positive behavior change in yourself and others Making change that sticks Your host Virtual Meeting Mark Clare New Value.